Swindon Supermarine were proud to help tell the story and play a part in the RAF100 celebrations on Saturday, hosting a group of Royal Air Force officers, Royal Air Force Association volunteers, as well as hosting 1244 Squadron Air Cadets band who played before the game and at half time and paraded the local token before it is displayed at the Birmingham International Tattoo in two weeks time. 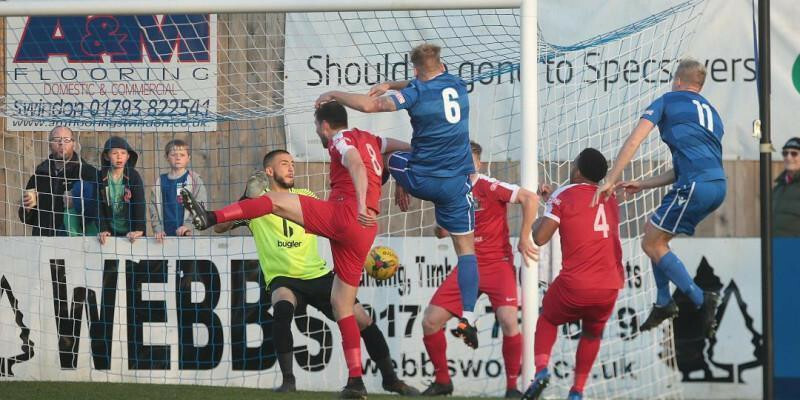 On the field however, it was a very similar story as Supermarine fell to another home defeat at the Webbswood Stadium despite taking the lead in the fifth minute. Lee Spalding gave a home debut to new signing Jamie Edge, who signed this week from Gloucester City whilst Will Henry made his home debut. The home sides came out of the blocks very quickly, winning two early corners. The first coming from a great save by Harrow Borough keeper Hafed Al-Droubi who parried Brad Gray’s effort from distance wide. The second and decisive corner came when new signing from Gloucester City Jamie Edge struck an effort that deflected out. Gray swung over a deep corner to the back post and with Al-Droubi routed to his line, Matt Williams rose highest at the far post to power a header home for his first goal since joining the club last month. Boro’ responded by forcing a series of corners but on each occasion were unable to find the net. Midway through the first half the home side had a warning of things to come, when Dylan Kearney found himself unmarked in the box, but he couldn’t direct his header goalward as it sailed over the bar. Two minutes later, the game was tied. Will Henry made a good low parried save from Kearney, the ball fell to Frank Keita who also saw his effort blocked by Henry but as the ’Marine defence failed to clear, right back George Moore took a touch before poking the ball into the net past Henry. Conor McDonagh should have given ’Marine the lead, but when he got away inside the area, he pulled the ball right across the face of goal when it looked easier to score. With the home side pressing to take the lead, ’Boro missed a couple of chances on the counter attack. Moore fired wide ahead of Kearney getting free following a long direct ball forcing Henry into another good save. With the game swinging in the away sides favour, Ryan Haugh was given the freedom of the Webbswood to swing over a delicious cross that Kearney got away from his marker to power past Henry. McDonagh once again fell foul of poor finishing as he got free inside the box, but took one too many touches with the goal beckoning and the Boro defence got back to put him off, deflecting the ball out for a corner. At half-time Spalding made a change, replacing Joe Shepherd for Connor Thompson as he looked to gain some extra width in the midfield. Thompson then had the first chance of the second half. Brad Hooper did excellently to create space for himself in the box, before pulling the ball back for Thompson who fired over left footed. Henry did well again saving at the feet of Ryan Moss. Hooper tried his luck from distance, but saw his first effort deflect straight into the arms of Al-Droubi and his second out for a corner. Gray almost played provide from the corner again, as Westlake’s glancing header just went across the face of goal and wide of the far post. Despite a succession of corners in the last few minutes, ‘Marine were unable to find a killer touch in the box and as the game went into time added on, Steve Baker’s team kept the ball excellently and Lewis Cole had the games final chance, firing low and straight at Henry at the near post.